When Jean Bonner and her husband Ben moved into the small rural community of Taieri, they didn’t know who to turn to for advice. At the time, the pair were relatively new to dairy farming, having only been in the sector less than a year. 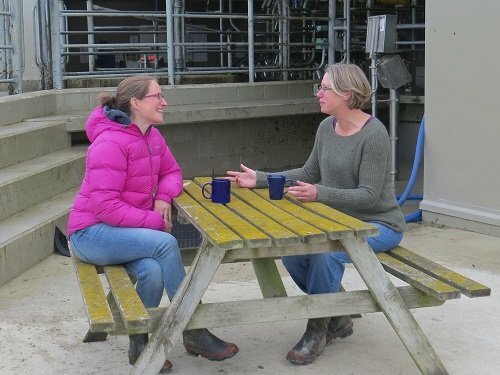 Jean reached out to DairyNZ and signed up to their support service, Dairy Connect, which links farmers looking for information on a particular topic with another farmer who has experience in that subject. Jean was paired with Anne-Marie Wells who, with her husband Duncan, won Dairy Business of the Year in 2015. Having moved to New Zealand from the United Kingdom, Anne-Marie could relate to Jean’s situation and the pair, who live just 5km apart, quickly became close friends. “It was uncanny how much we had in common. It was pretty exciting from my perspective as we didn’t really know anyone in Taieri well at that stage,” Jean says. Inspired to help connect other rural people in the area, particularly women, the pair set up the Taieri Rural Community group. “The typical farmers’ wife role seems to be, for many, doing the bookwork and looking after the kids. This means they are often isolated, and seldom interact with anyone aside from their husband and kids,” Jean says. It can be even more challenging for those without children, as schools are often the meeting hub in a small community, she says. But the group isn’t just restricted to farmers, it’s open to anyone in the community. “We never wanted it to be exclusively for farmers. It’s all about building a sense of connection in the community,” Anne-Marie says. And it’s proving popular. Their first meeting had 40 women attend, and a strong turnout since. To help make it easier for everyone to stay connected and up-to-date with what events they have coming up, they have set up a Facebook page, ‘Taieri Rural Community’. The events range from coffee catch-ups to discuss quick meals to prepare during calving, to practical sessions on rose pruning and reversing a trailer. The pair encourage anyone new to farming or who have any questions to reach out to Dairy Connect. Anne-Marie says she jumped at the opportunity when asked to be a Dairy Connect mentor to help give back to the dairy sector by building capability within it. “Farming is different to other sectors as it’s very open and people are happy to share what works, because we’re not in competition with one another. We’re all working together,” she says. She has found it rewarding to be part of Dairy Connect. “It’s nice to have a support network of people that understand each other. I appreciate how difficult it can be to ask for help and Dairy Connect makes it that little bit easier. To find out more about Dairy Connect visit dairynz.co.nz/dairyconnect. For more information on the Taieri Rural Community group check out their Facebook page.